We have 18 RV or live-in horse trailers sites – all with power and water hook-ups for your convenience. Call ahead to book your reservation and check availability. Included in our camping fee is full access for your entire party to our bathhouse. In addition to modern restroom facilities, the bathhouse also provides shower stalls in both the cowboy and cowgirl sections. 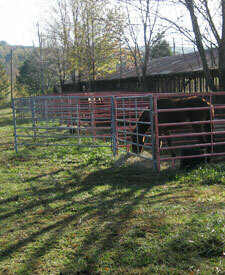 Also included for your horses we have both long lines and horse pen’s for your convenience. We offer 30 covered stalls -first come first serve- for $5 per night. Hay, bedding, and bags of ice are available for purchase as well. In addition to our camper/RV spots, there are a few primitive camp sites available as well.